does kimi keep his engineer that he always had trouble understanding? We might here of some moves in weeks to come with engineers. I'm glad that Kimi stays in the family. He seems pretty content, too, that's not too bad. Hopefully he will have a strong car next year and I believe he will understand that the team & Vettel needs his full support for the rest of the season. I am glad Ferrari finaly realised that young fresh blood is needed! LOL Kimi will stay in the role of a backup, in case Charles messes things up next year. Thats the only reason I can see for Kimi to stay. Huge pressure on Charles, he knows he has to deliver otherwise gets demoted to Sauber again. If that is the case, then it is very clever from Ferrari. And must be enormous pressure what Leclerc has, but he seems to be much more mature than his age suggests. Nah... AlfaSauber is a Ferrari B team. Having Kimi there will be an unofficial 4 car testing season come 2019 for Ferrari. ;) They have the engines, some staff might follow Kimi to Sauber too so let's see. F1 heads already mentioned they are keeping a close eye on team alliances. Ironic if you ask me coz the timing seems to come right after Mercs' B Team ForceIndia was sold and yet people still claim FIA is all out to help Ferrari. With a world title to his name, I thought Kimi would have easily call it a day and do something else like rally or so on. Instead of driving around in the mid field. Anyway I wish him all the best. A great send off to Kimi to a family team, and also (finally) Leclerc confirmed to the Scuderia. It's exactly what the team needs, bold moves, as I don't exactly remember when was the last time we put a young gun behind the wheels of a red car. As for those that ask if Kimi is going to "behave" for the last races, I am pretty sure he will be driving and supporting Seb just fine as I am pretty sure that part of his salary at Sauber is going to be paid by Ferrari. Thank you for everything Kimi Räikkönen! Please, Kimi, stay motivated and focused until the last lap of this season. Please. Dear Kimi, many thanks and please keep the faith champ! I am sure he will. Otherwise he wouldn't sign the Sauber deal. He loves his racing. Should have told him before, so he could go to McLaren. In a way sad to see him go but equally excited to see leclerc in a Ferrari mixing with the big boys. 2019 is gonna be exciting. Kimi also played a major part in bringing Ferrari to where it is today. So a very very big thank you to Kimi. I dobut this was decided over night and Kimi would have been aware of what was happening and his team speaking to other teams. McLaren would expect him to do a lot more "extra" work than Sauber will I imagine. I would think so, as McLaren would have given a lot more "extra" cash. I agree. I also think Sauber will be as competitive as McLaren if not better. McLaren is in ruins. McLaren is making heavy losses at the moment. They are selling their assets right and left. McLaren made an offer for Ricciardo, considering he was asking 20 mil a year. Also keep in mind they are paying Fred a lot more than that right now. I am sure they would have had the money. Well he won't achieve anything driving in the midfield. He should retire and leave the seat for young drivers. I doubt Kimi needs a little bit extra money for the extra work McLaren would want, plus Sauber is closer to home. F1 fans and Liberty Media don't agree. One of the most popular drivers on the grid and now with Alonso gone his importance is even bigger. 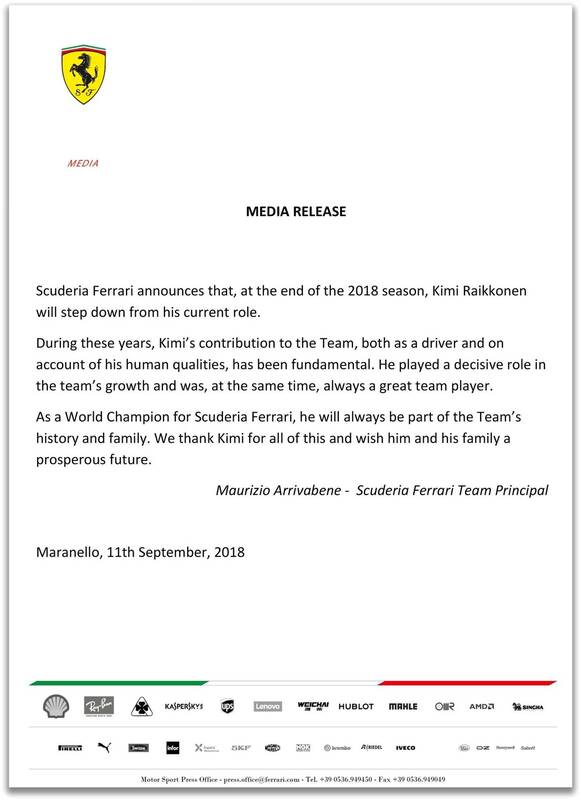 Kimi is leaving? Sorry I was taking a sshhhhhh stool movement. If the seat at Ferrari isn't there anymore, Kimi should have retired. Going to Sauber and "battling" for 10th place is undignified of a Champion. Leave that to Alonso, Kimi is better than that. Yes, good news for Raikkonen and his fans I guess....but not good for the future of the sport. It does not surprise me that people do not see this anything more than a desperate attempt to continue his F1 career. I think there is more to it than that ie. Scuderia Ferrari asked him to participate in the project to improve this Ferrari B-team. OK, what a silly idea from me.